I often wonder to myself (and now, thanks to this blog, publicly) if I take some things that I observe in my daily life a little too seriously for my own good. I have a wide variety of roles that occupy the majority of my waking hours but I have been known to fixate on things that do not directly impact them from time to time. 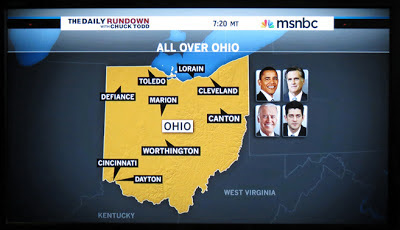 If you are a regular reader of this blog, you would have seen an item that I recently posted about how Dayton, Ohio was being incorrectly positioned on graphics displayed on the cable news channel MSNBC back in late September. Since this is my main source for television news, I was forced to endure repeated airings of this error and, as the post documented, I 'tweeted' my dissatisfaction. 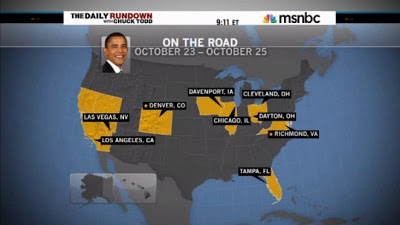 It finally took a venue change for the event they were using that graphic for (an appearance by Republican presidential candidate Mitt Romney in Dayton was being moved to the city's airport in nearby Vandalia and had become a joint appearance with his running mate, Wisconsin representative Paul Ryan). At the end of that piece, I selflessly credited my actions in perhaps playing a minor role in that on-screen revision and I privately hoped that such a recurrence would not happen. Almost a month to the day later, that hope was, regrettably, extinguished. On Thursday's edition of The Daily Rundown, host Chuck Todd (who was in "The Buckeye State" to moderate the third and final debate between Senator Sherrod Brown and Ohio state treasurer Josh Mandel later that evening in Cincinnati) introduced a map in a discussion on presidential campaign appearances throughout the state. 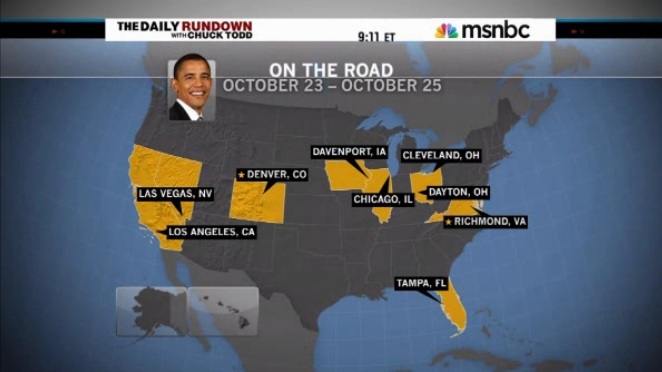 This map had PowerPoint-like arrowed boxes that pointed to the locations of these events by all four members of the two party's tickets. 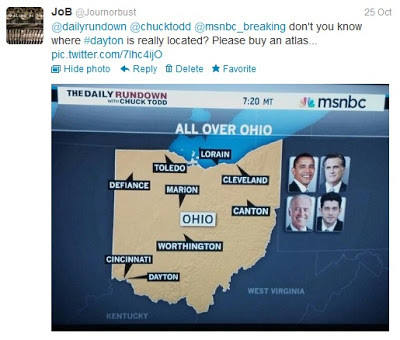 Nine different cities were called out in that "All Over Ohio" item, with some of them not as well-known as the major metropolitan areas of Cincinnati, Cleveland and Columbus (Worthington is a suburb just north of the state's capital city). At a very cursory glance, I could see that most of them were positioned in the geographical 'ballparks' of where they should be with one glaring exception. Dayton, the county seat of Montgomery County and the state's sixth largest city, was again being displayed by MSNBC as being adjacent to the greater Cincinnati metropolitan area instead placing it where it actually sits, nearly 60 miles due north of "The Queen City". It really baffled me as to why such an egregious error was being repeated. Other graphics featuring Ohio appeared to demonstrate the creator's understanding of the state's basic geographical features. 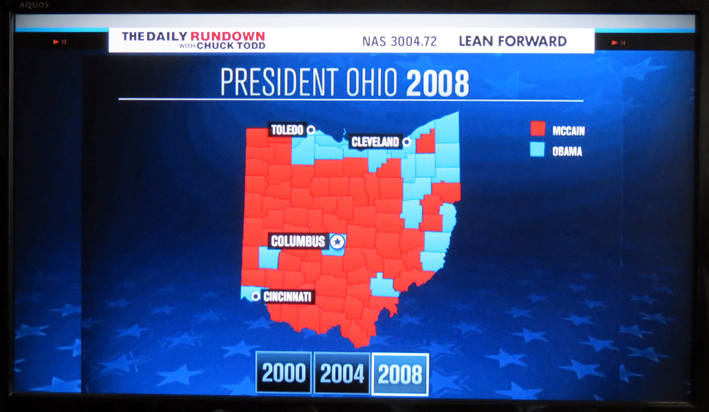 In a story about presidential voting histories over the three most recent elections, that map featuring all of Ohio's 88 counties was put on the screen with markers and text boxes for four cities superimposed over it. Since Montgomery County normally trends Democratic (and Dayton sits pretty much smack dab in the center of it), that blue-filled shape might serve as a guide for future MSNBC visual products. To place a city in a wrong spot once is human error; to continue to get it wrong for six straight days is indefensible; to repeat the same mistake, just one month later while getting nine other Ohio cities correctly positioned, is--in my opinion--totally unprofessional. And, somewhat bizarrely, it appears that it is only done when Dayton shares the stage with its larger sister to the south. 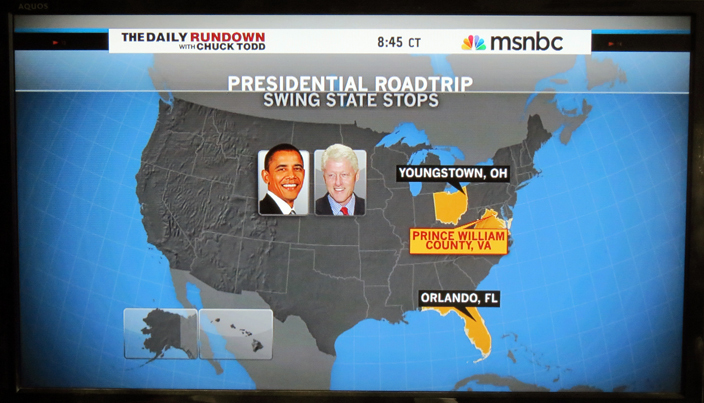 The graphic above from Tuesday morning's show demonstrates what happens when they are not co-displayed (it might be a little tough to see due to the number of locations and the scale of the map, but Dayton is correctly positioned on this very 'busy' eight-state graphic). Despite my rekindled frustration on Thursday morning, I limited my feedback to MSNBC to just that single Twitter message I displayed above (this is in direct contrast to my September 'barrage' of notifications and comments via that microblogging service) and turned off my television for the rest of that day. 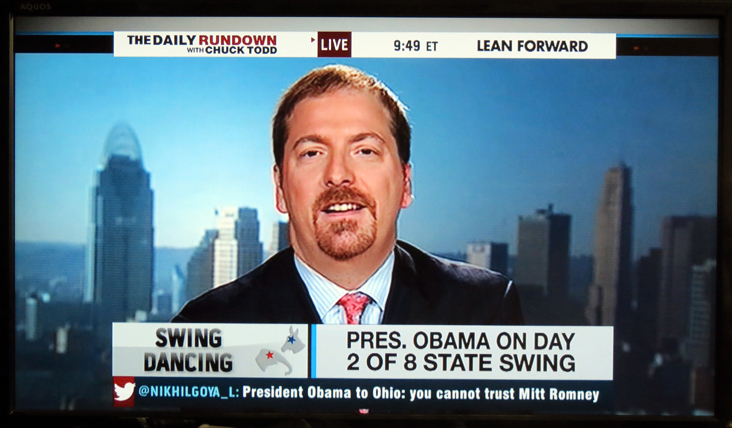 On Friday morning, I was again greeted by a Cincinnati-based Todd at 9AM who brought up more discussions about Ohio's role in the current presidential contest. It was not until the show's "Deep Dive" segment that I witnessed what may have been a response to my criticisms. 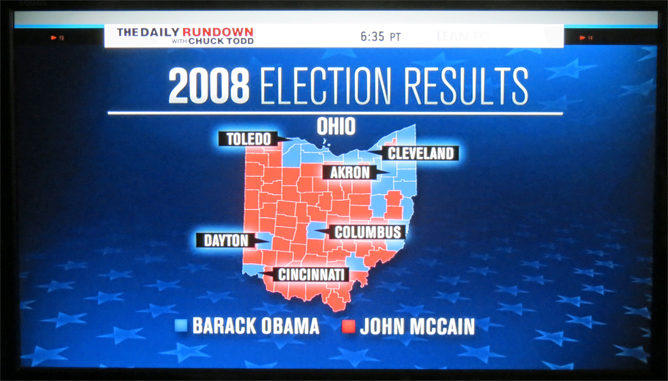 While again mentioning the state's election results histories, a new graphic replaced the one seen just 24 hours earlier--and this one included"The Gem City" exactly where it is supposed to be (and they added Akron to reflect the state's six biggest cities by population). I will not be as naive as I was the last time to think that my 'tweet' was the catalyst for this correction. In the future, I resolve to simply provide a quick note and an attached picture to identify mistakes that I notice on their programming and leave it at that. 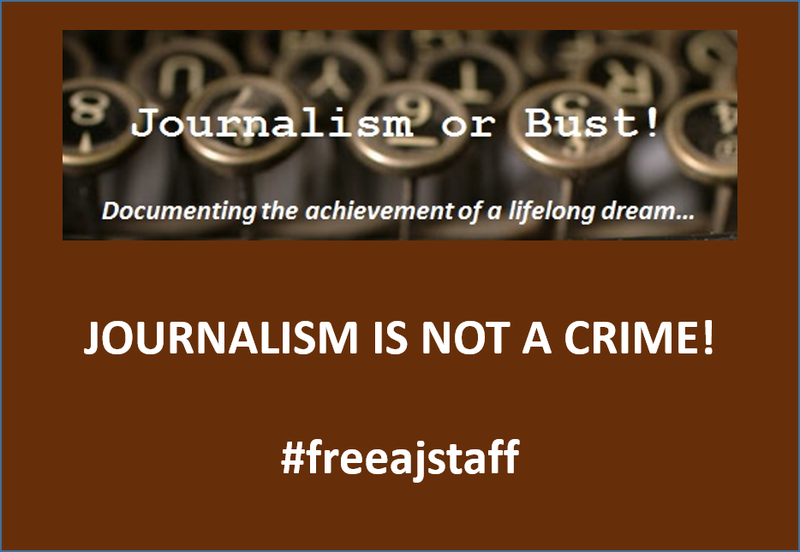 I am a loyal viewer of The Daily Rundown, and while I have taken up this cause twice now on this blog, such infrequent errors about things that do not even register with most of their viewers will not dissuade me from tuning in every weekday morning. I'm just asking that you quit treating Dayton as the "Rodney Dangerfield of Ohio"...is that too much to ask?